There will be times while working in your yard or garden when you might feel a little like Goldilocks. If your soil is hard and dense, the water and nutrients your plants need will be unable to reach their roots. If your soil is loose and crumbly, water will drain from the soil before your plants can absorb it. Your goal is to get your soil just right so that your lawn or garden can thrive. Because clay soil is so dense, some gardeners, farmers, and lawn care professionals consider it the most challenging type of soil. However, working with clay soil isn’t an impossible task. All you need are the right kinds of material to add to it and a garden tiller to blend it all together to get healthy, bountiful soil. You might be surprised to learn that the ideal soil for growing crops contains only five percent organic matter! Air and water take up a full 50 percent of the soil space, and minerals make up the remaining 45 percent. Don’t worry. You don’t need to take out a ruler and try to measure tiny bits of rock in your lawn or garden bed. The important point to know is that clay soil contains a lot of small, fine particles. They pack tightly and make it difficult for water and nutrients to move where they need to go. They also can block the growth of your plants’ roots. How Can I Tell If My Soil Is Heavy in Clay? Image credit: “Soil texture,” Lynn Ketchum/Oregon State University. Made available through a Creative Commons 2.0 License. 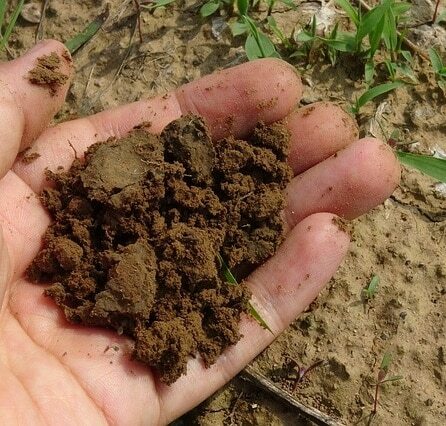 The feel of your soil will help you figure out if it’s heavy in clay, too. 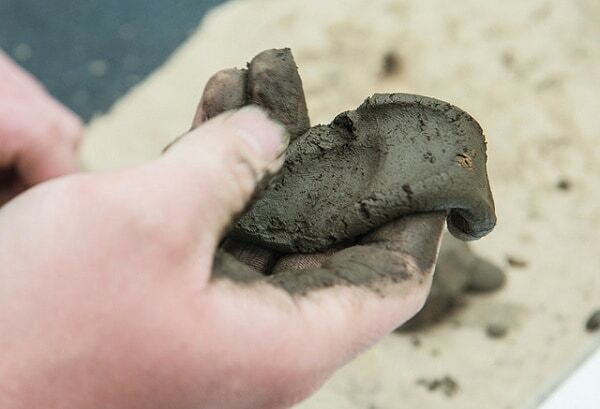 Wet clay soil tends to feel sticky, while dry clay soil tends to feel hard and almost brick-like. It’s easy to imagine just from your sense of touch how those small mineral particles can cause big problems in a yard or garden. How Do I Amend My Clay Soil? You can’t simply purge all the clay particles from your soil, and you wouldn’t want to, either. Having some clay in your soil will prevent water and nutrients from leaching away before your plants can use them. However, you can improve the balance of your soil’s solid components, also called its structure. The best way to do that is by mixing in other materials, which, when added to soil, become known as amendments. Organic matter is your best bet, and the easiest, most affordable form of organic matter you’ll find is compost. A layer of compost spread about three inches thick over your garden plot will be enough to break up your soil (and provide plenty of nutrients, too). Some people think that sand helps break up clay because of its loose, grainy structure. However, clay particles tend to stick to sand particles and form unmanageable clumps. You need to add a lot of sand (about three parts coarse sand to one part clay soil) for the sand to be an effective amendment. 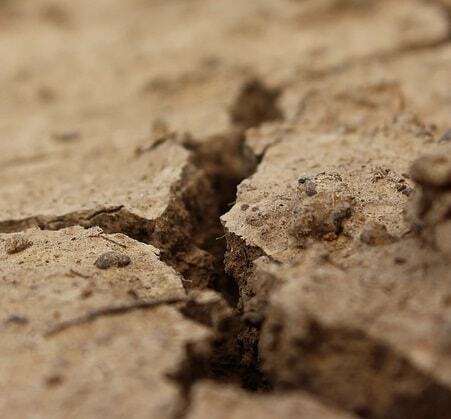 Minerals like lime and gypsum can loosen clay soil, but lime also can change your soil’s acidity, and that affects which plants will successfully grow. Lime additionally risks thickening your soil by reducing its moisture-retaining capacity too much. Only use lime after testing your soil’s pH level and consulting with a soil expert. No matter which amendment you choose, you’ll need to mix it into your soil. This is where your garden tiller becomes essential. To get the most out of your soil amendment, till it into your soil as deeply as you can. Although most cultivators can dig deep enough, you might find a garden tiller more efficient if your clay soil is especially dense. 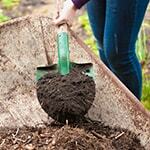 Tilling to a depth of six to eight inches will encourage healthy growth in your plants’ roots. The best time to till is the beginning of the growing season before you’ve sown your seeds. Avoid tilling when your soil is wet—it will be heavier and more difficult to till and will likely become compacted. Soil that’s slightly moist is ideal for tilling. What If I Don’t Have Enough Clay? The opposite of clay soil is sandy soil. It’s lighter in color than clay soil, will be difficult to roll into a ball, and won’t form a ribbon. 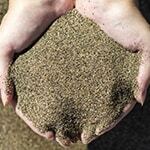 Sandy soil presents a completely different problem than clay soil. Because its particles are so big and have such large spaces between them, it doesn’t hold on to water or nutrients long enough for plants to absorb them. Although the problem is different, the solution is the same. Adding several inches’ worth of organic matter such as compost and tilling it in as deeply as possible will form manageable clumps in your soil and leave a healthy amount of space between them. 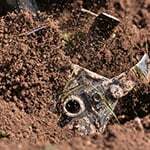 How Should Healthy Soil Look? The ribbon test is just as helpful after you've added your amendments. Form your ball of soil and push it upwards with your thumb to create a ribbon, just as you did earlier. If your ribbon breaks when it gets to be about an inch long, your soil has a good consistency. You can further check your soil by wetting a pinch of it and rubbing it between your thumb and forefinger. Healthy soil should feel neither gritty nor silky smooth, but in between those two textures. These simple tests will let you know that your soil is just right. When you use your tiller to mix amendments into your difficult lawn or garden soil, you’ll find that you can build soil where you can grow your plants happily ever after. Shaping Clay Into Perfect Garden Soil.. Our Power Equipment Direct how-to library can help you learn about How to Grow Crops with Raised Rows or Beds, Proposition 65 Product Labeling and Sales Tax Information.